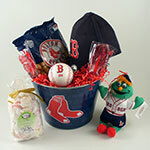 Boston Red Sox officially-licensed 5-quart pail. These metal pails are made of rust-resistant galvanized steel. Each has a waterproof sealed bottom and is great for holding ice, water, dirt, or anything else you would like to carry or hold in a fine decorative pail. Measures 7" high x 9" diameter. Made in USA.